Is it possible to port/simulate "Save file window" like a GetUserFileNameForRead() with this? ah,shame..... Just one more question, when drawing rectangle dynamically it does not refresh if you resize (to lower number) until the mouse is released.View is updated only if the rectangle has expanded,but not if its shrinked. Is this my error somewhere? Could you post the code, so that we can try to check it? To shrink or remove previously drawn GDI elements, either REAPER must redraw the underlying window, or if the window is static, you need to draw over your own GDI elements, using the original window content. The original window content can be stored in bitmap 1, combined with the rectangles in bitmap 2, and then blitted to the screen. To see how SWS coded their marquee "Zoom tool", check out https://github.com/reaper-oss/sws/bl...Zoom.cpp#L1002. I do not quite understand - could you explain a bit more? Last edited by Sexan; 10-28-2018 at 09:01 AM. I will try to include such a function in the next update. Actually you can use it for file saving, you just need to select the file on which you want to save thing. The only confusing thing is that the label window is "Open" rather than "Save". The request is still valid then. and a Select Folder would also be very welcome ! E.g. JS_MIDIEditor_ArrayAll() is listed in the API doc to take a reaper.array as argument, but reaper.arrays are only available in Lua (afaik), so does this work for the other scripting languages too? Just one more question, when drawing rectangle dynamically it does not refresh if you resize (to lower number) until the mouse is released.View is updated only if the rectangle has expanded,but not if its shrinked. Is this my error somewhere? * I use ASbmp to store the underlying window content. This must be updated whenever the window changes and REAPER redraws the window (and removes the script's rectangles). IIRC, SWS checks GetScrollInfo for changes. Last edited by juliansader; 10-31-2018 at 07:12 AM. 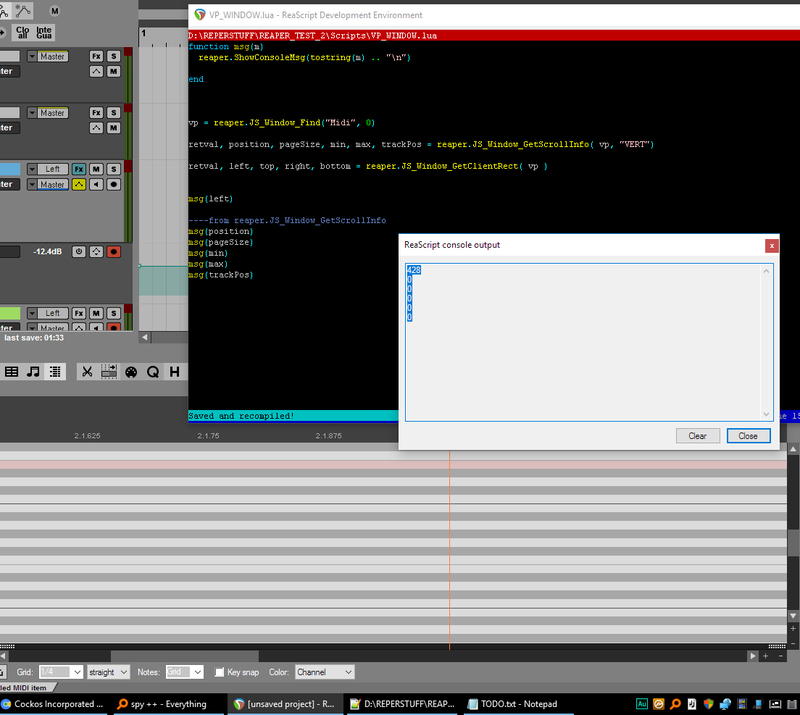 All the "Array" functions have "List" equivalents, which save the information in strings rather than reaper.arrays. I'm not really familiar with EEL, but AFAIK reaper.arrays are simply 64bit double arrays, except for the first 64bits which give the max allocated size and currently used size as two 32bit ints, so any language that can read/write such constructs, should be able to use reaper.array functions. Last edited by juliansader; 10-31-2018 at 07:10 AM. Last edited by Sexan; 10-31-2018 at 09:16 AM. As I'm doing something similar currently (linked above) one more question if you don't mind..
Is it correct that say EEL scripters are then required to provide arrays to these functions strictly in the reaper.array format (i.e. as you said first 64bits which give the max allocated size and currently used size as two 32bit ints) as otherwise determing the array size would fail, no? Ok something is not right...empty project took 3gb of ram ?? Last edited by juliansader; 10-31-2018 at 10:37 AM. Last edited by juliansader; 10-31-2018 at 10:42 PM. How do reaper.arrays work internally? Maybe it's possible to reimplement this to make these functions useable in Python and Eel as well. Yes, but is it a file with some Python-code or something Reaper-specific? And is it documented somewhere? You can open it with a text editor. It wraps the SWS ReaScript functions for Python. Tweaking of "reascriptedit" section in REAPER.ini helped me to restore showing data in that window. If no message of type "WM_LBUTTONDOWN" has been intercepted yet, the return time and params will be 0. Menu is triggered when right click is pressed (along with some modifier shift-crtl etc). As you see when menu is closed and mouse is pressed again (left click) it still thinks that right click is down. Last edited by Sexan; 11-09-2018 at 01:03 PM. Last edited by Sexan; 11-12-2018 at 02:05 AM. juliansader, It seems that while these functions do not work? Unfortunately I don't know how REAPER handles keystroke events. Mouse events are passed to the foreground window's "message queue" (where they can be intercepted), but keyboard shortcuts appear not to be. Last edited by Sexan; 11-17-2018 at 01:27 AM. Which window's scrollinfo are you trying to get? Hope I do something wrong) JS_Window_GetClientRect works fine! Last edited by Xenakios; 11-16-2018 at 04:43 PM. The window argument for GetScrollInfo must be the window that actually contains the scrollbars -- typically some child window. In the case of the MIDI editor, for example, it will be the "midiview" child window, not the MIDI editor parent window. Thanks a lot for explanation you are amazing! I have uploaded a new extension that may be of interest to other scripters: "js_ReaScriptAPI". Could you, please, add to your "js_ReaScriptAPI" a function to receive and send OSC-messages (OSC Client and Server)? I use Reaper and LUA for creating live setups and I really need a function to hear outgoing OSC-commands with LUA-script (with specific port and IP and send OSC-messages to a specific port and IP). The Reaper itself supports OSC, but today there’s no way to send OSC from script and to receive OSC to a script. I would be very thankful for this help. And ready to pay for your time in any reasonable amount. The reason why this update was somewhat delayed, is that I was trying to figure out how to return long strings (for example, if dozens of files are selected in an Open File dialog) and strings that contain \0 characters (for example, packed Lua strings). Fortunately, Justin noticed my threads, and the upcoming version of REAPER will allow API functions to return such strings. The extension will therefore require an up-to-date version of REAPER. The update is not yet available via ReaPack, but in the meantime if anyone is interested in testing the new functions, it can be downloaded and installed manually. It requires one of the recent dev versions of REAPER. * FindChildByID: (Thanks to amagalma for reminding me about this.) IDs seem to be a more reliable cross-platform way of getting child windows (such as the arrange view within the main window, or the piano roll within an MIDI editor), than searching by title ("trackview" or "midiview") or by Z order. * Localize: If searching for standard windows such as "Actions" or "Navigator" by window title, localized (translated) titles should be used. * Several ListView functions: Useful for finding selected items in any list window, such as the FX chain. * Open files, save file and select folder dialogs. * All the "List" functions that previously stored long strings in ExtStates. These functions now return the long strings directly. Last edited by juliansader; 12-03-2018 at 02:51 AM. Great stuff! Thanks for all your hard work! Would the listview functions be any good for getting the command id of the selected item in the action list? EDIT: Tested it out - absolutely perfect - so much neater than having to manually copy and paste the command id into my scripts. Also being able to grab the action description is really great too! No more cryptic command id's for descriptions! Last edited by lb0; 12-03-2018 at 03:56 AM.